Our Glow Annual Survey for 2016 is now live. The annual survey is important as it helps us gather information on how customers use Glow and helps us to improve the service. We are keen to hear views from the broad base of Glow customers – both staff and pupils. The survey will remain open until the 1 July 2016. All responses collected are anonymous and will be treated in confidence. This entry was posted in Professional and tagged Early Learning and Childcare, Glow App Library, Glow development, Glow Help and Support, Glow in practice, glow meet, Glow TV, Help and Support, National Digital Learning, National Digital Learning Week, News, Primary, secondary, Updates, User news on 18 May, 2016 by Glow Scotland. The DYW e-bulletin has become a rather popular monthly publication which provides informative news pieces for all those involved in the deliver of the DYW agenda. You can sign up the DYW e-bulletin here. This entry was posted in Professional and tagged Attainment, CfE, CLD, creativity, Digital Learning, DYW, DYW e-bulletin, Inclusion and Equality, News, Outdoor Learning, Professional Learning, research, Skills, Skills for Learning Life and Work on 6 May, 2016 by K. Mayer. -Two days of inspiring keynotes, 70+ workshops and networking activities delivered by experienced primary and secondary teachers ; 15-16th October 2015-that's just before half term for some of us in the UK. How much does it cost?€150 : This price includes a delegate pack, lunches and refreshments, and access to all the workshops, keynotes and other events on offer. How to find out more / register your placeFull details about the conference, including how to register and the full workshop programme, can be found on the Practical Pedagogies Website. Other queries can be sent here. 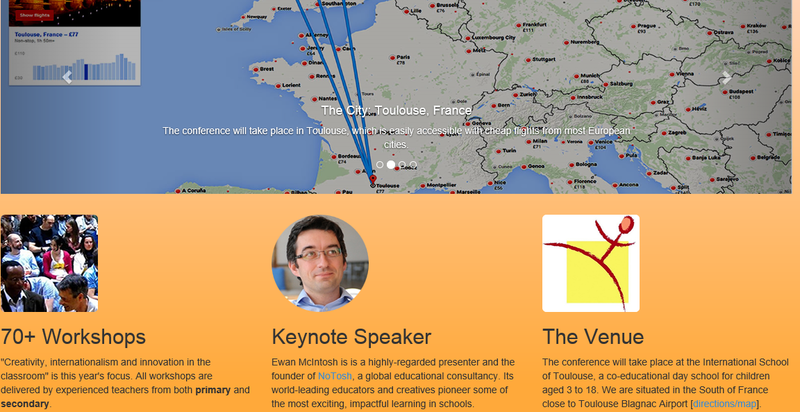 The conference will take place at the International School of Toulouse, a co-educational day school for children aged 3 to 18, situated in the South of France close to Toulouse Blagnac Airport [directions/map]. Explore the potential of tools such as Pinterest and Twitter to motivate all pupils to develop reading and writing skills in EAL and MFL. Increase your pupils' independence as language learners and understanding of linguistic structures. Support the development of all your pupils' language skills and their linguistic creativity. Led by Isabelle Jones (@icpjones), languages consultant and Head of Languages in Cheshire, England. This workshop will present collaborative learning strategies in MFL which engage whole classes to talk / write simultaneously therefore maximising class time. Delegates will go way with a much deeper understanding of the benefits of collaborative learning and will have a bank of ready-made resources (F/G/Sp) to use immediately on their return to school. Using Quizlet to create interactive resourcesThis workshop is designed to help mainly modern languages teachers who want to teach students easy ways to revise grammar rules, verb conjugation and new vocabulary with Quizlet. This US software allows students to be more independent leaners and give them an opportunity to be more responsible for their own learning. Boosting language acquisition for lower and upper primary through a FUN Reading Program. Developing comprehension and expression for upper primary (intermediate levels) through a Reading Program. The conference has its own Twitter Practical Pedagogies feed. We will be using the hashtag #pracped15 to allow delegates to share the ideas and resources they are being presented with and discuss the conference outcomes. This entry was posted in Professional and tagged collaboration, Curriculum, EAL, Event, International Dimension, Leadership, Learning and teaching, News, Primary, Social Networking, training on 12 August, 2015 by Isabelle Jones. This entry was posted in Professional and tagged makingmathsmatter, News, numeracy, Video on 10 April, 2015 by David Gilmour. This entry was posted in Professional and tagged News, Resources News on 14 January, 2015 by David Gilmour. This entry was posted in Professional and tagged News on 24 November, 2014 by David Gilmour. This entry was posted in Professional and tagged News on 17 November, 2014 by David Gilmour. This entry was posted in Professional and tagged News on 7 November, 2014 by David Gilmour. This entry was posted in Professional and tagged News on 30 October, 2014 by Janette Gaunt.